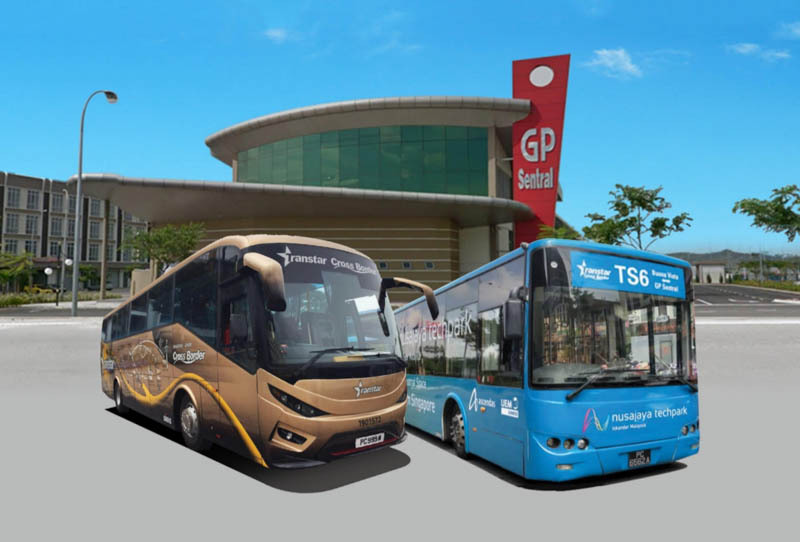 When you choose which bus to travel with, you need to consider your final destination in JB. The traffic tends to be heavier at Woodlands, but during peak period such as Public Holiday, both borders are equally heavy. Both checkpoints are open 24 hours a day, 7 days a week. If you are planning for shopping, cafe hopping, food hunting, mall hanging out, you may choose to go to JB Sentral. 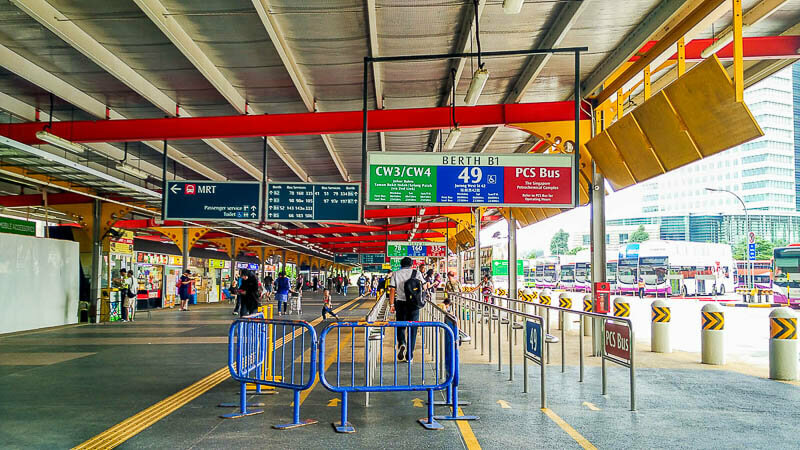 JB Sentral is the area near JB Custom which consists of Johor Bahru City Square, Komtar JBCC, JB Sentral Bus Terminal, Jalan Wong Ah Fook, and Jalan Dhoby, all within minutes of walking. 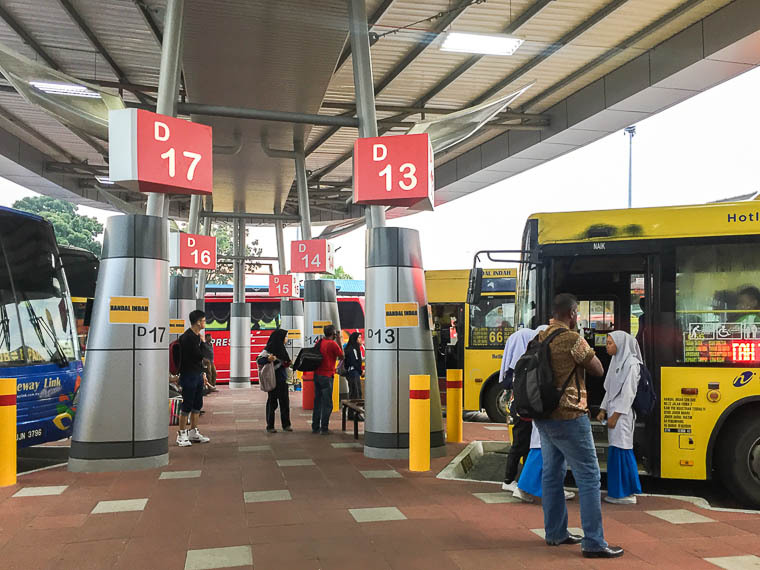 If you are planning to go to Larkin Terminal to take other buses to continue to other parts of Malaysia, you may choose either Woodlands or Second Link. If you are going to other parts of JB that are near Second Link (such as Bukit Indah, Iskandar Puteri), you may choose Second Link. Which Border has Less Traffic? Typically, first link is more congested than second link. However, it doesn’t mean that I will choose second link over first link all the time. What I usually do before crossing the border is checking the traffic cameras at both checkpoints and checking Google Maps for estimated traffic condition. The traffic cameras are updated every minute so it’s pretty accurate. If you see a traffic jam, do investigate whether it’s jam on car lanes or bus lanes. Sometimes, the car lanes may have heavy traffic but the bus lane is literally empty. What traffic cameras can’t show you is the traffic condition at JB Checkpoint, because these cameras are installed by Singapore side, not Malaysia. So, if you see a clear bridge, don’t be too happy first. Instead, check the traffic condition at Google Maps, maybe there’s a traffic jam at Malaysia side. How to check traffic condition in Google Maps? Choose “traffic” function in Google Maps. On mobile, it’s located at top right corner, under the arrow. On desktop, it’s under the menu located at top left corner. The function will show you traffic condition in colors. Dark red means extremely heavy. But again, heavy traffic refers to car traffic, not bus traffic. There’s a lot of guestimate when trying to predict bus traffic. At Kranji MRT Station, take exit C to the bus stop. Money changer with reasonable rates is available here, as well as a food court. On weekends, expect huge crowd so leave your house early. 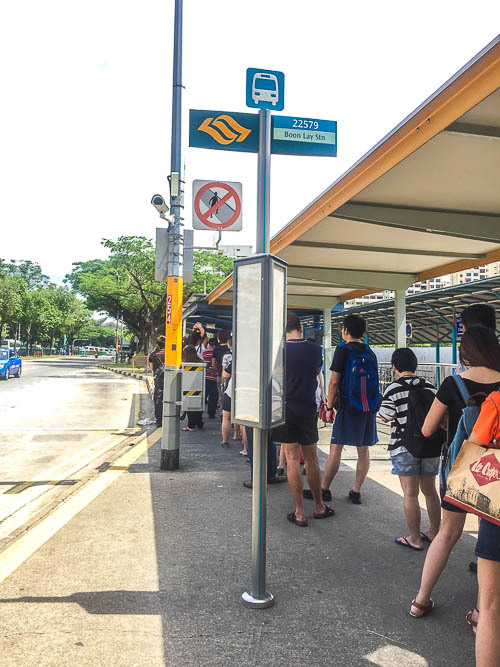 Here, you can take SBS Bus 170 blue plate, officially referred as SBS Bus 170x (Fare: S$ 1.39 by EZ-Link card; or S$ 2.00 by cash) or Causeway Link Bus CW1 (Fare: S$ 1.50 by cash only). For information, there are 2 types of SBS Bus 170: red plate and blue plate. Blue plate (or officially 170X) leaves from Kranji and ends at JB Sentral Bus Terminal with only a few stops in between (see http://www.transitlink.com.sg/eservice/eguide/service_route.php?service=170X for the full list of stops and fare). Red plate (bus 170) leaves from Queen Street Terminal (see point #3 below) and ends at Larkin Terminal with many bus stops in between (not recommended due to long journey). Boarding bay for bus 170x blue plate. Meanwhile, boarding bay for CW1 is further behind. 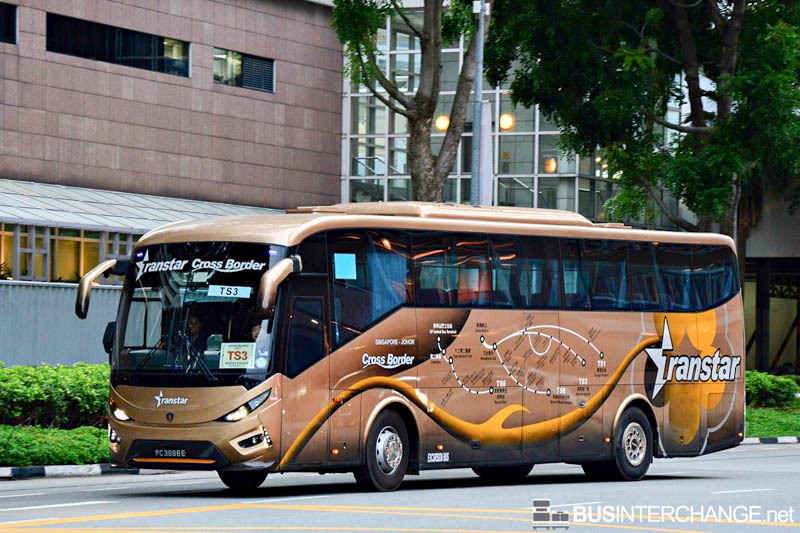 Bus CW1 only have 4 stops: Kranji MRT Station, SG Woodlands Checkpoint, JB Sentral Checkpoint, and Larkin Terminal (Refer to https://www.causewaylink.com.my/singapore-bus for full CW buses information). 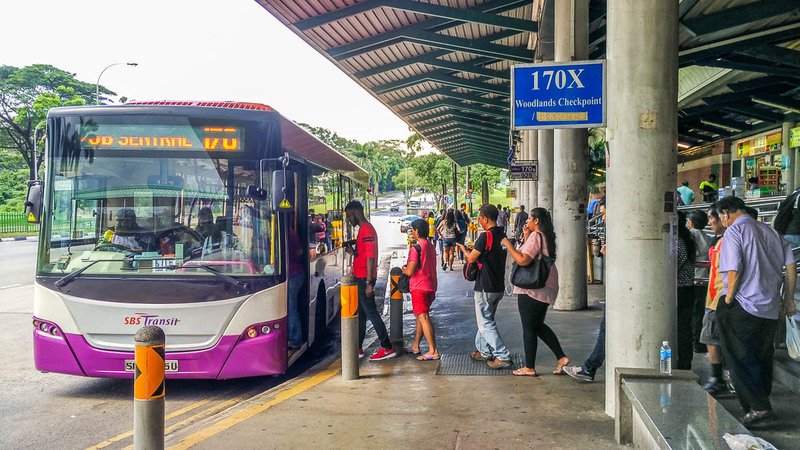 My personal favorite is to take SBS Bus 170X because I would take MRT to Kranji, and then continue with bus 170X, so it is considered as a transfer, therefore I will get discounts on the transport fares (if the transfer is done within 45 mins). To understand about the transfer, you may visit here. I would choose CW1 only when there is a long queue for 170X but there is little or no queue for CW1. 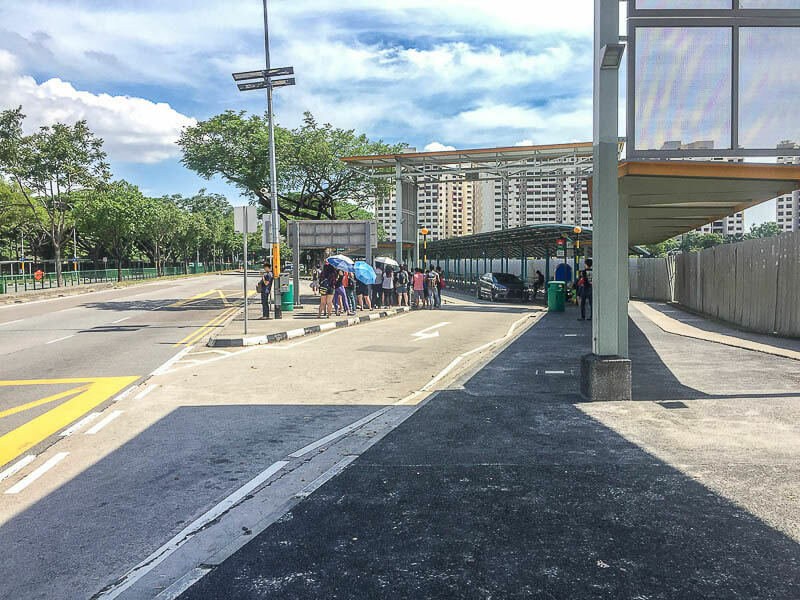 From Woodlands MRT station, walk to Woodlands Bus Interchange (follow the signs to Bus Interchange) and take SMRT Bus 950 (Fare: S$ 1.43 by EZ-Link card; or S$ 2.20 by cash). The bus ends at JB Sentral Bus Terminal. Refer to http://www.transitlink.com.sg/eservice/eguide/service_route.php?service=950 for the full list of stops and fare). SBS bus 950 is my 2nd personal favorite (after 170X), especially when it is peak period (weekend or evening). Tips: When you’re in a rush but unable to board bus 950 due to long queue, take bus 856 instead. 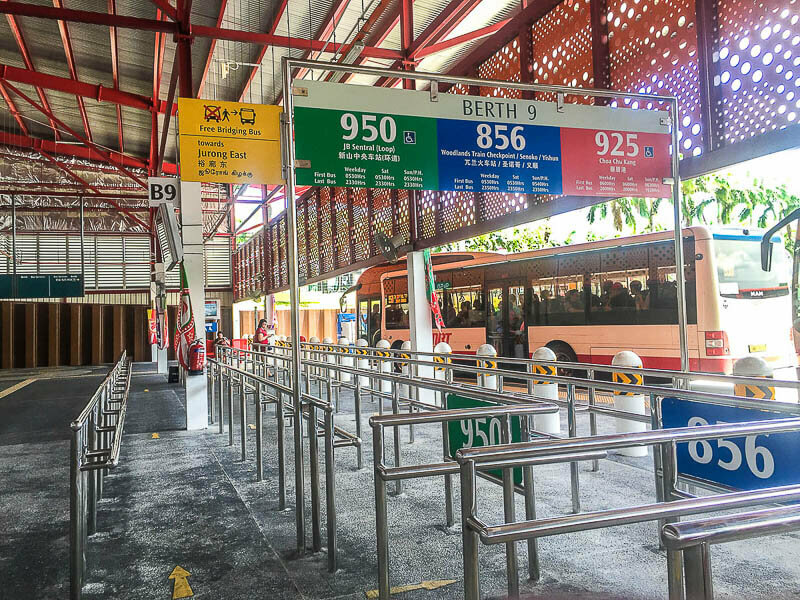 Bus 856 will bring you to Woodlands Train Checkpoint; from there, you can walk to Woodlands CIQ (7 mins walk) through the Train Checkpoint building. Queen Street Terminal is about 15 mins walk from Bugis and Rochor MRT stations. It is located at Queen Street, between Arab Street and Ban San Street. From Bugis MRT, take exit A or B, walk along Victoria Street until you meet Arab Street, and turn left. From Rochor, take either exit A or B, walk towards Ophir Road, turn left to Rochor Canal Road, then turn right to Ban San Street. There are 3 options of buses from Queen Street Terminal: SBS Bus 170 red plate (Fare: S$ 1.97 by EZ-Link card; S$ 2.50 by cash), Causeway Link Bus CW2 (Fare: S$ 3.00 by ManjaLink, S$ 3.30 by Ez-Link, S$ 3.50 by cash) and Singapore-Johore Express Bus / SJE (Fare: S$ 3.30 by cash). 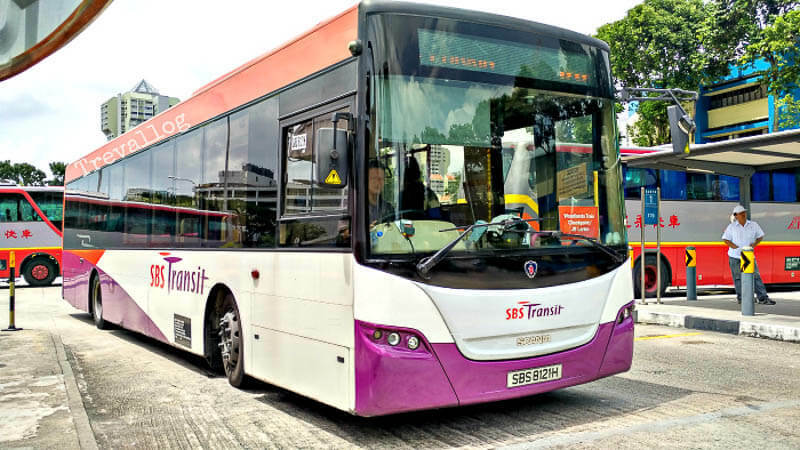 SBS Bus 170 red plate leaves from Queen Street Terminal and ends at Larkin Terminal with at many bus stops in between, including Rochor Stn, Opp Little India Stn, Newton Stn, Stevens Stn, Botanic Garden Stn, Tan Kah Kee Stn, Sixth Avenue Stn, King Albert Park Stn, Hillview Stn, Opp Bukit Panjang Stn (refer to http://www.transitlink.com.sg/eservice/eguide/service_route.php?service=170 for full list of stops and fare). I would not recommend bus 170 because it stops at too many locations so you are wasting time on the road. CW2 only have a total of 4 stops: Queen Street Terminal, SG Woodlands Checkpoint, JB Sentral Checkpoint and Larkin Terminal (Refer to https://www.causewaylink.com.my/singapore-bus for full CW buses information). Now, you can use EZ Link, Manjalink or cash for CW2 bus. If you use cash, remember to buy your cash token before queueing. 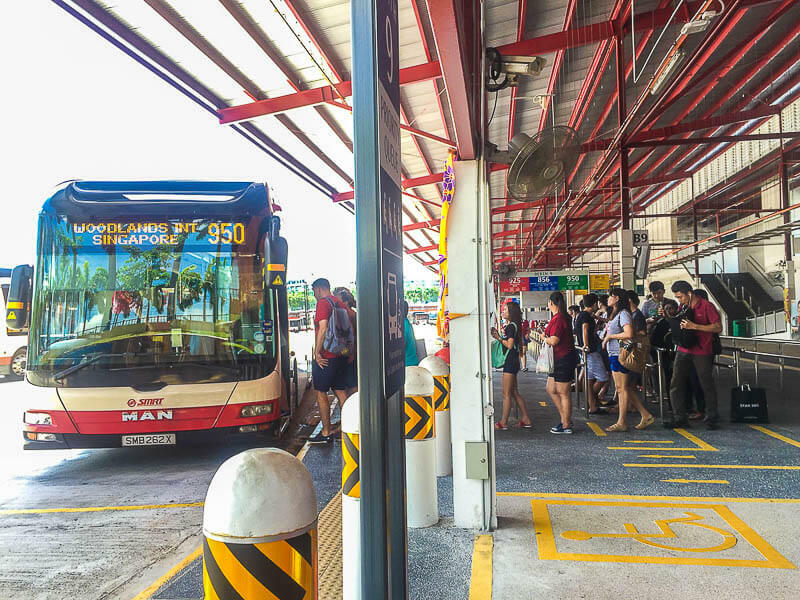 Tip for CW2: if you don’t mind standing on the bus for the entire journey (could take up to 1 hour plus in the evening or weekend), you can skip the long queue, wait til all the people in the q stop boarding, then board the bus. Yep, most people in the long q will not board if there are no more seats, they don’t want to stand and would rather wait for the next bus. Bus SJE route is exactly the same as CW2. 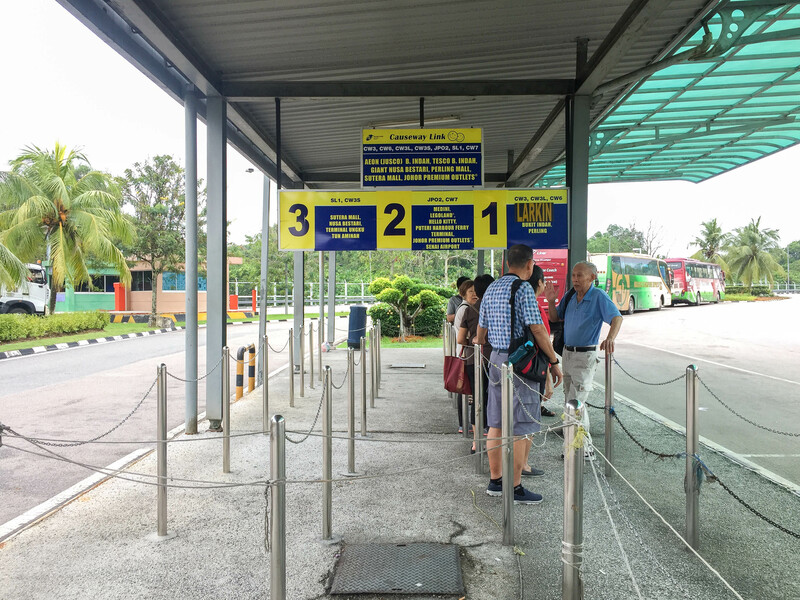 Do note that if you take CW2, once you got your passport stamp at Woodlands Checkpoint, you could board any CW buses to go to JB Sentral Checkpoint. Seats for SJE bus are more comfortable compared to CW2. As for frequency of both CW2 and SJE bus, it is hard to predict. If I were to choose between CW2 and SJE, I definitely prefer CW2. From Jurong East MRT, take exit A, and follow the direction to Bus Interchange. 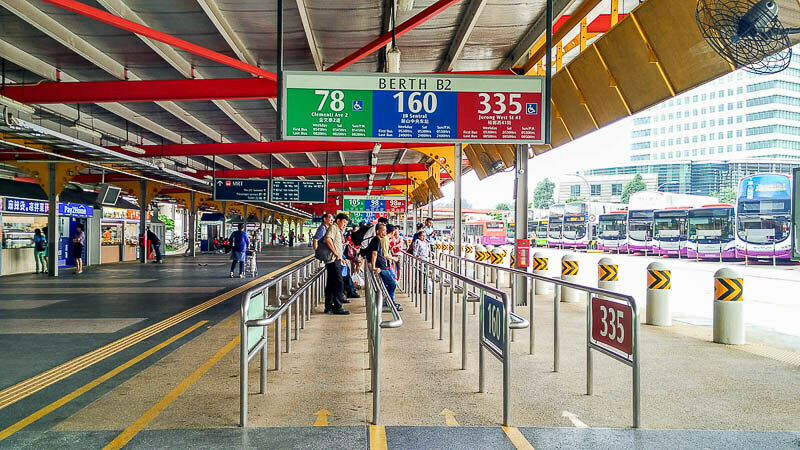 There is 1 bus that goes to JB via Woodlands Checkpoint which is SBS bus 160 (Fare: S$ 1.84 by EZ-Link Card; S$ 2.50 by cash), but there are 3 buses that go to JB via Tuas Second LinkCheckpoint: CW3 (Fare: S$ 4.00 by cash to Larkin), CW4 (Fare: S$ 4.00 + RM 4.20 by cash to Pontian Bus Terminal) and CW4S (Fare: S$ 4.00 + RM 4.80 by cash to Sutera Mall). SBS Bus 160 ends at JB Sentral Terminal. I personally do not recommend you to take bus 160 because it passes through many stops before Woodlands Checkpoint. The full route and fare can be found at http://www.transitlink.com.sg/eservice/eguide/service_route.php?service=160. Meanwhile, CW buses do not have too many stops, but they only go to Second Link, not Woodlands. 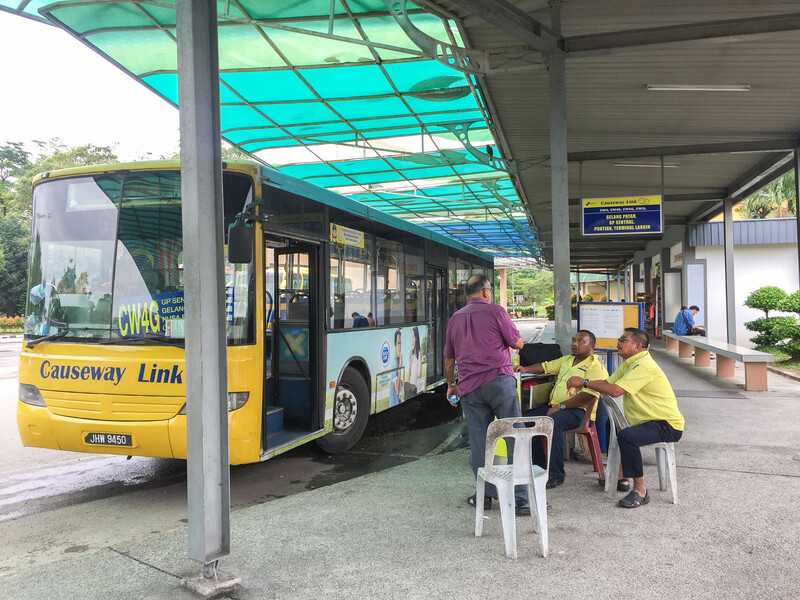 Bus CW3 ends at Larkin Terminal by passing through SG Tuas 2nd Link Checkpoint, Gelang Patah Bus Terminal, Taman Bukit Indah, Perling Mall, Taman Tasik). The full timetable can be found in CW website. Bus CW4 ends at Pontian Bus Terminal by passing through SG Tuas 2nd Link Checkpoint and Gelang Patah Bus Terminal). The full timetable can be found in CW website. 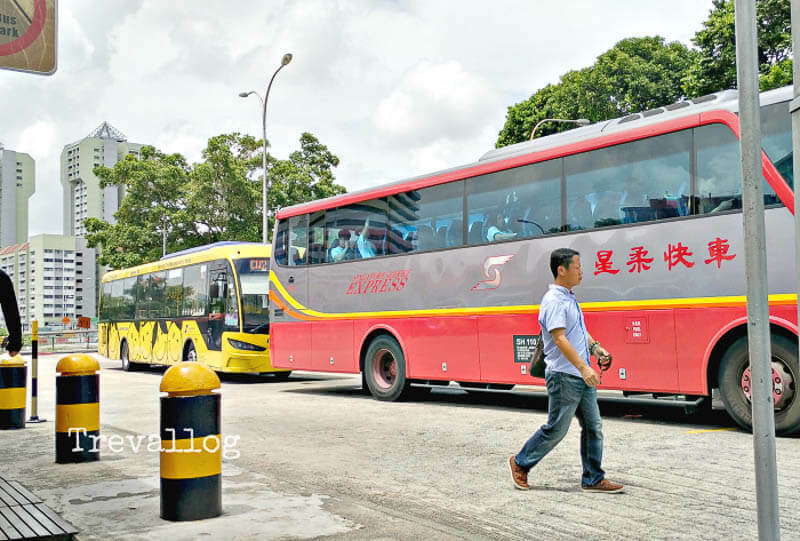 Bus CW4S ends at Sutera Mall by passing through SG Tuas 2nd Link Checkpoint, Gelang Patah Bus Terminal, Lima Kedai, Taman Sri Orkid, Taman Ungku Tun Aminah). The full timetable can be found in CW website. From Newton MRT, take exit B. After that, make a U-turn and follow the path to Clemenceau Ave. Turn right and walk along Clemenceau Ave until traffic light, cross the road, and walk through the open-air car park, then you will find CW5 bus stop. Follow the direction on Google Maps below. Here, you can take Causeway Link bus CW5 (Fare: S$ 3.30 by cash). This bus only has 3 stops: Newton Food Centre, SG Woodlands Checkpoint, JB Sentral Checkpoint. It is the best choice if you are staying/working near Newton/Orchard and going to JB Sentral only. The full timetable can be found in CW website, refer to the link in point #1. From Boon Lay MRT, take exit B, walk straight until the main road (Boon Lay Way), then turn right, and you will see the bus stop. Refer photos below. Here, you can take Causeway Link bus CW6 via Tuas 2nd Link (Fare: S$ 4.00 by cash only). This bus has a few stops: Boon Lay, Tuas 2nd Link Checkpoints, Taman Bukit Indah, Giant Nusa Bestari, Taman Tasik, Larkin Terminal. The full timetable can be found in CW website, refer to the link in point #1. From Boon Lay MRT, take exit B and you will see this. Walk straight and then turn right. After you turn right, you can see the bus station from which CW6 departs. Notice there’s a long queue. This is the bus stop that CW6 departs from. There is a CW counter here as well if you’d like to ask for more information. 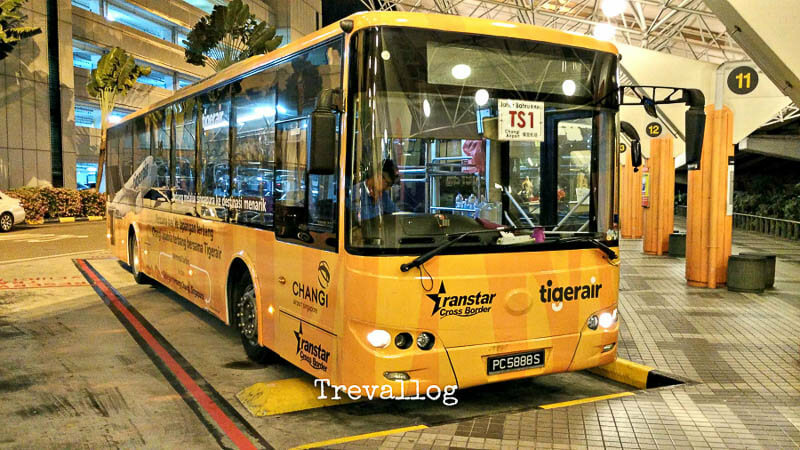 From Changi Airport, you can take Transtar Bus TS1 from Terminal 2 and Terminal 4. Fare: S$ 9.00 by EZ-Link; S$ 10.00 by cash (pay when you board the bus). The bus starts at Terminal 2, Terminal 4, several stops in between, and eventually ends at JB Sentral Checkpoint. The full routes, schedule and fares can be found at http://www.transtar.travel/cross-border-services/. If you have questions when you’re on the ground, just approach the counter at Terminal 2, Level 1. Sometimes, timing or boarding bay may change, so it’s best to check with the counter. 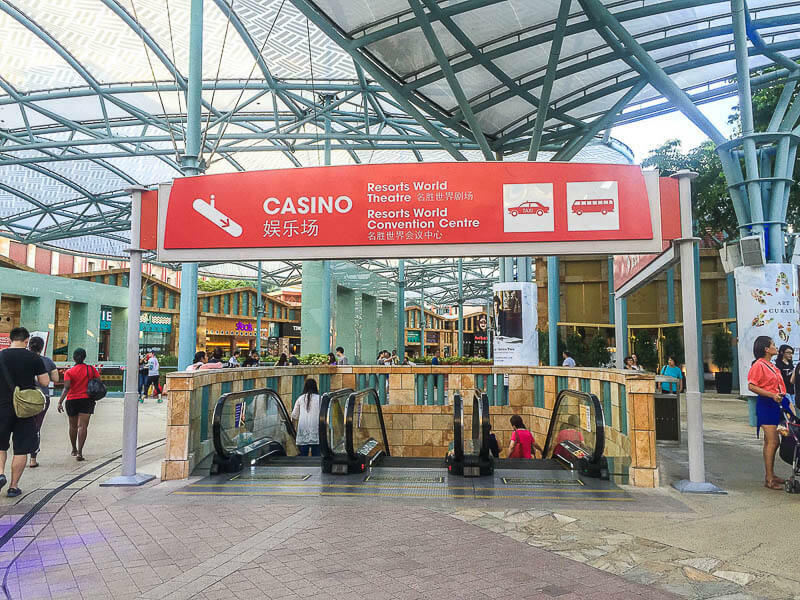 From Harbourfront Station, you can wak throgh “Boardwalk” to Resort World Sentosa, or take Sentosa Express Monorail from Level 3 of Vivocity and alight at Promenade Station. Here, you can take Transtar Bus TS8 from Basement Coach Bay. Fare: S$ 6.00 by EZ-Link; S$ 7.00 by cash. The bus ends at JB Sentral Checkpoint. The full routes, schedule and fares can be found at http://www.transtar.travel/cross-border-services/. If you have any questions when you’re on the ground, just approach the counter at the Coach Bay. Sometimes, timing or boarding bay may change, so it’s best to check with the counter. This is the view near casino. Just follow the direction to Coach Bay. Alternatively, you could consider another bus provider from 707 travel group. 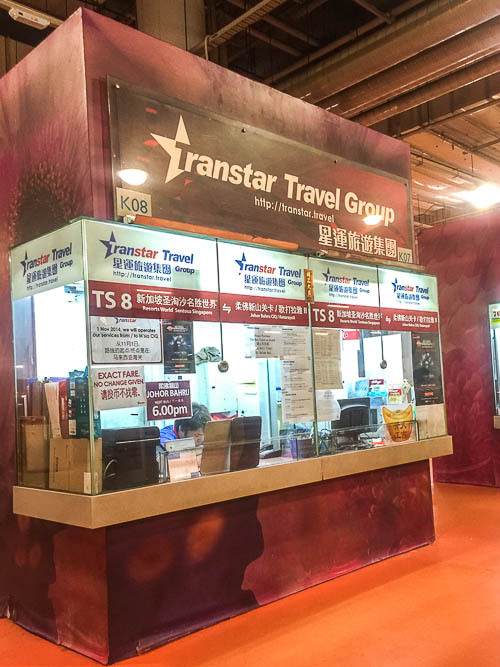 The counter for 707 is just nearby Transtar counter. The price is slightly cheaper than TS8 but the timing is not so frequent, and I am not sure whether this is a direct bus or with some stops in between. 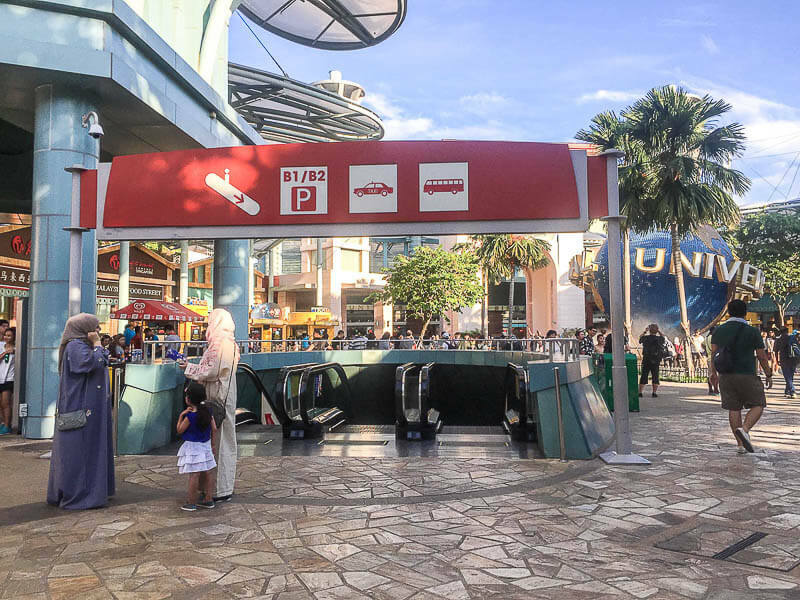 From Yishun MRT station, take exit C. You will need to take the escalator in front of NTUC Fairprice down to the tunnel, then take escalator up to Northpoint Shopping Centre. Inside Northpoint, follow direction to the bus interchange. At Yishun bus interchange, one can take bus AC7 to JB Sentral Checkpoint, passing through many stops in between. Fare: S$ 2.20 by EZ-Link Card; S$ 2.50 by cash. More information on the full routes can be found here and here. Bus TS3 brings you from Singapore CBD (Central Business District) to Johor Bahru CIQ via first link (Woodlands) and vice versa. 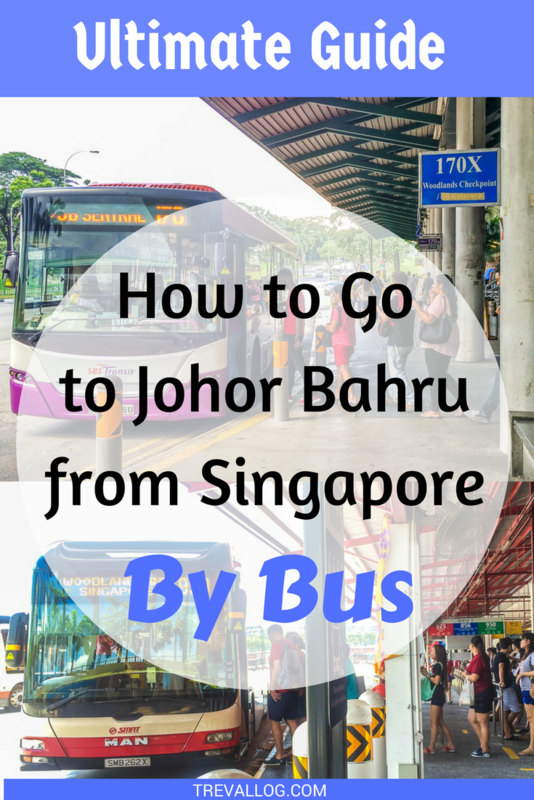 It’s suitable for Johoreans who work in Singapore but stay in Johor Bahru, as well as tourists who stay at CBD or Chinatown but wants to visit Johor Bahru on a day trip. Take note that the bus only operates in the morning and evening. To get to Pan Pacific Hotel, you can take MRT to Promenade and then walk for 450m. 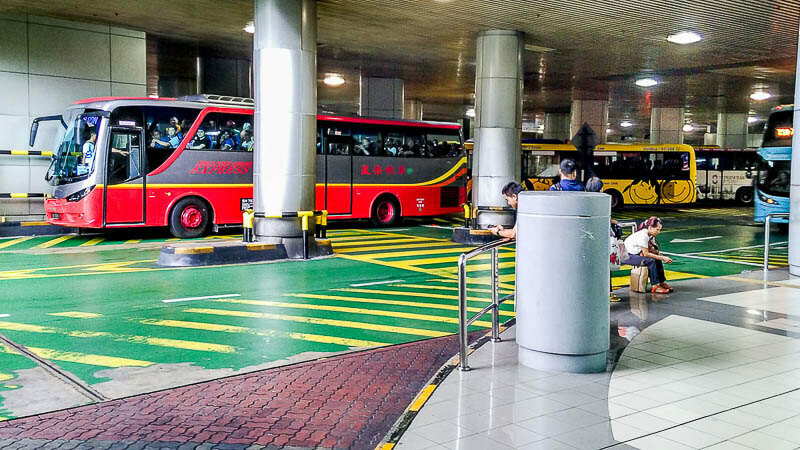 You can also board the bus from Downtown MRT Station, Clarke Quay and several other bus stops. You can find bus TS3 full route and schedule here. The price is SGD 6 by EZ-Link; and SGD 7 by cash. The exact fare is to be paid on board; no change will be given. Bus TS6 is an alternative of bus CW3. Typically, residents who stay and work in the west part of Singapore would go to Jurong East (see point 4 above) and take bus CW3/CW4/CW4S to Johor Bahru via second link. Now, people who stay/work near Buona Vista MRT, One Nort MRT, Kent Ridge MRT, Jalan Ahmad Ibrahim, Gul Circle MRT, Tuas West Road MRT, Tuas Link MRT can save time by taking TS6. Bus TS6 terminates at Gelang Patah Bus Terminal, from which you can catch another bus or ride a Grab (sign up for Grab here and use my code “GRABTREVALLOG” to get discounts for your ride) to other parts of Johor Bahru. You can find bus TS6 full route and schedule here. The price is SGD 4.5 by EZ-Link; and SGD 5 by cash (similar price with CW3). The exact fare is to be paid on board; no change will be given. Tuas Link MRT station is the westernmost MRT station. It is really near Tuas Checkpoint, however, you can’t walk to Tuas Checkpoint from here. Instead, you need to take Causeway bus CW7. It costs $4 by cash, $3.8 by EZ-Link and $3.5 by Manjalink. When using EZ-Link do note that you need to tap on the card reader located at the counter, not inside the bus. Also, EZ-Link can only be used in Singapore, not in JB. If you’re using cash and Manjalink, you can do so inside the bus. 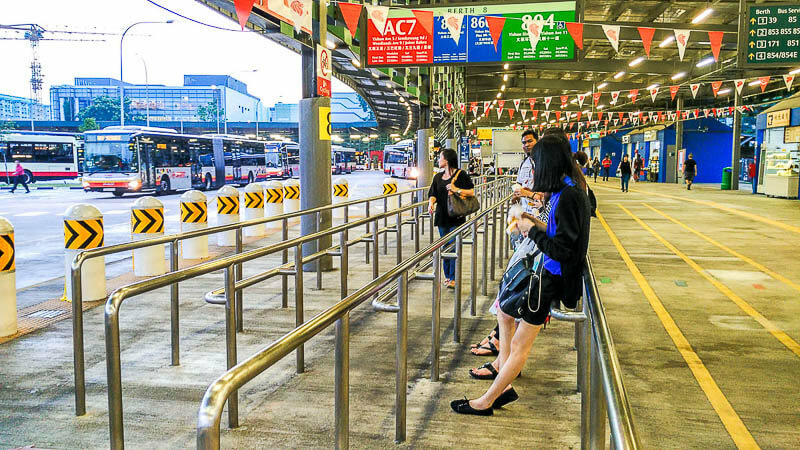 To go to the bus boarding point, take the Exit A at Tuas Link MRT Station. When to Tap In & Tap Out? 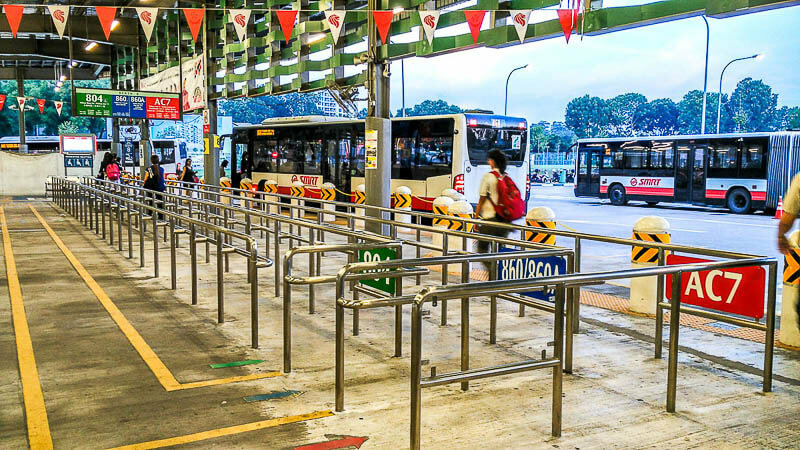 If you’re using EZ-Link, here’s the general rule about taking public bus in Singapore: You need to tap in every time you board a bus, and you need to tap out every time you alight from a bus. It doesn’t matter whether it’s your final destination or you’re doing a transfer of bus, you have to tap in and tap out every time you enter and exit the bus. If you’re going to Larkin Terminal, go to bus station below immigration at JB CIQ. Wait for your bus. Tap in when you enter the bus. When you arrive at Larkin, tap out again. When you arrive at JB Sentral Checkpoint, make your way to the counter and get your passport stamped. No immigration card is required to be filled for entry into Malaysia. Once you are done with passport, get out from the counter area and walk straight. 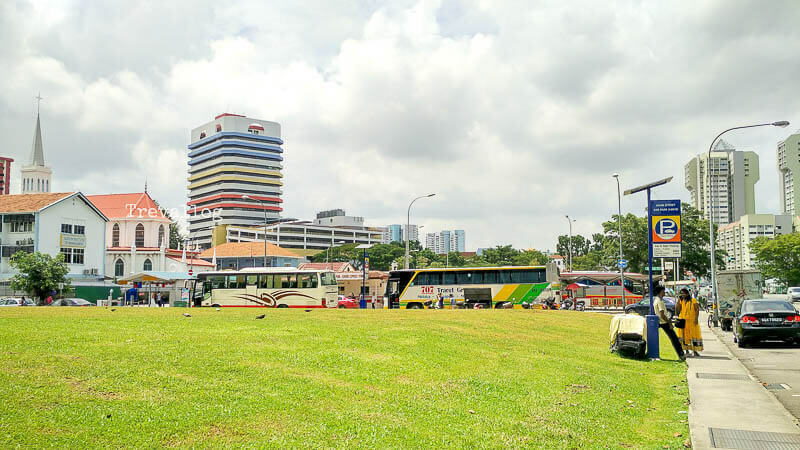 You will then have 2 choices: go to the bus stop at Basement and continue to other parts of JB with a bus; or walk to JB Sentral and enjoy your getaway. Just follow the signs along the way. Crossing border at Second Link is similar to that at Causeway. 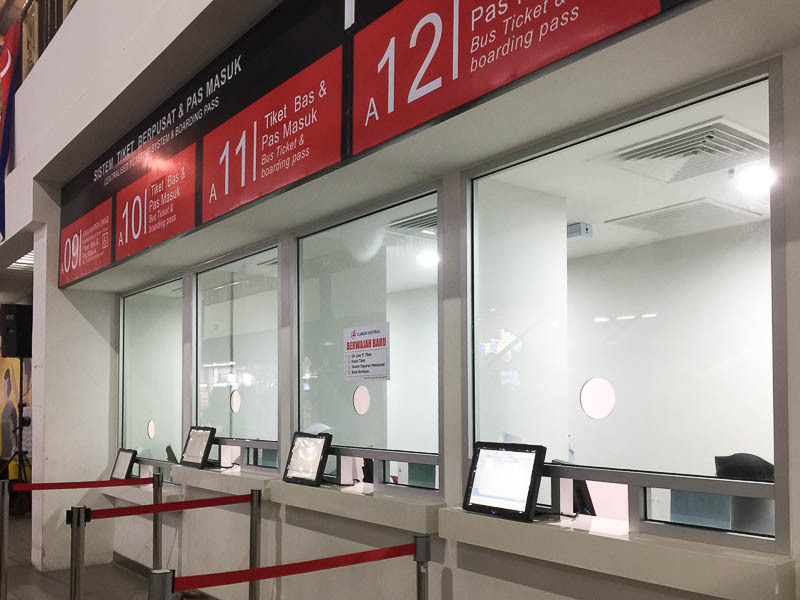 Once you get your passport stamped at Tuas Checkpoint, proceed to bus boarding area and board bus to go to JB Second Link Checkpoint. 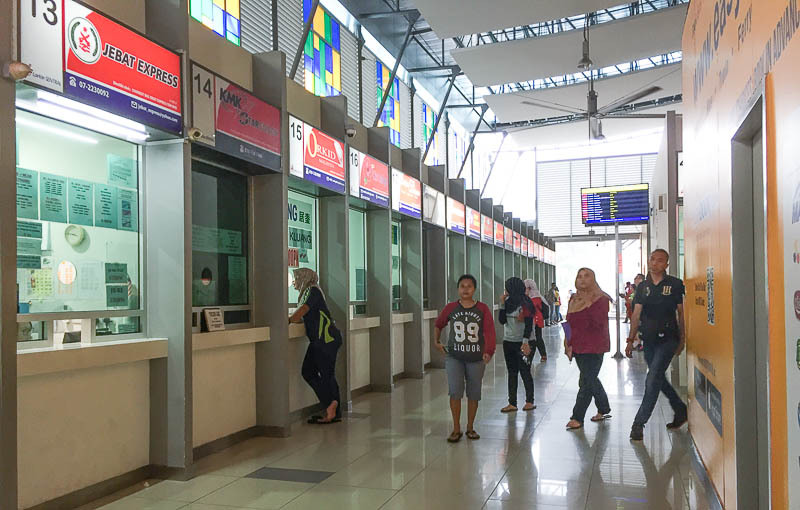 Once your passport is stamped at JB Second Link, proceed to bus boarding area and board the bus that will bring you to your next destination. How to Cross Border at Midnight When Public Buses Don’t Operate? First of all, I don’t recommend crossing the border between 12 midnight to 5am when the public buses don’t operate because it’s just too risky. But if you really really have to do so, I recommend you take taxi/grab to the Woodlands Checkpoint (not Tuas). After your passport is stamped, go the the bus waiting area. Chances are, you’ll find Bus Pekerja or inter-city buses. If there are many people waiting for bus, join the queue. Bus Pekerja usually charges around RM 1 to RM 2 for the short ride between the checkpoints. 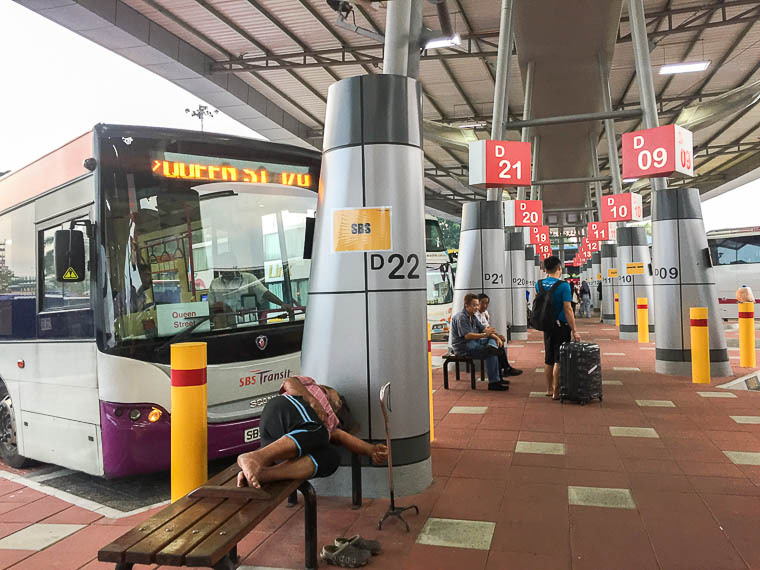 If there are not many people waiting for bus, approach the bus drivers and ask them whether they can allow you to join their bus to JB Checkpoint. Prepare cash in advance because these buses don’t accept EZ-Link or cards. What if there are no bus at all? I hate to suggest this but you have 2 options: wait until there’s a bus or walk across the bridge (which is a terrible and dangerous idea). 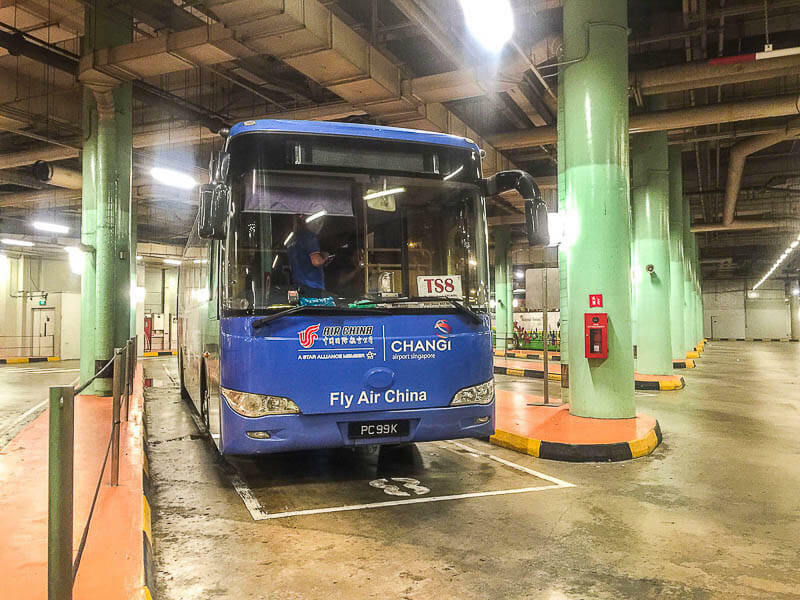 If you are going to Singapore from Larkin Terminal, you can board SBS Bus 170, SJE bus, CW1, CW2, CW3 to JB Checkpoint; and CW6 to JB Second Link. The fare for CW buses is significantly cheaper if you board in JB compared to SG. Check CW website for more info on the fare. Since Larkin Terminal is undergoing renovation in 2017 and 2018, the platform for buses is not fix yet. One day, you can find SBS/CW buses in platform D, other days they’re are at other platforms. So, just look around or ask people! 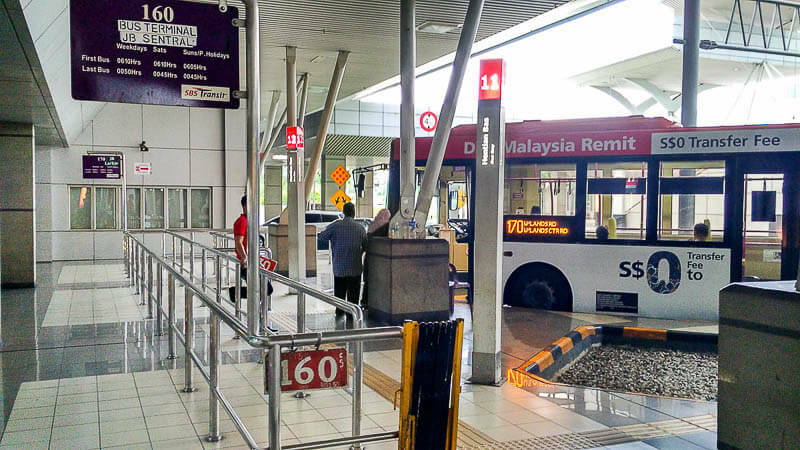 From Larkin Terminal, you can board other buses to go to other parts of Malaysia. You can buy the tickets from ticket counters that are located inside the building. DO NOT buy bus ticket from the men who approach you when you walk around Larkin, most of the time they are trying to sell you expensive tickets on buses that have many stopovers. You can also buy bus ticket online from platforms such as easybook.com or busonlineticket.com. Some bus operators require you to check-in at bus counter to get your seat number. If you come from Singapore to Larkin, you can’t predict what time you arrive at Larkin due to traffic so it’s risky to buy online. However, for PEAK period (Christmas, New Year, Chinese New Year, National Day, etc), bus tickets will be sold out early, so it’s better to buy online or buy in advance from the counter. Disclaimer: All information is correct as of the time of writing. Any subsequent changes might not be reflected here. I’m not sure you’re referring to which bus, I can only guess it’s either CW2 or SJE. From my own experience, these public buses do not wait for its passengers to clear immigration. Once I pass the immigration, I simply wait for the next bus. The buses keep coming throughout the day. For CW2 and SJE, you simply show your ticket to the bus driver and they’ll let you in; it doesn’t have to be the EXACT same bus that you took from Singapore to the immigration. Hope this helps. Thanks very much for your sharing, the information is very clear and helpful, really appreciate it! hi.. do you know if we can board the buses from Woodlands CIQ even if we didnt board them before hand to reach CIQ? Hi Sabira, yes you can board the buses from Woodlands CIQ. Just make payment either with EZ Link or cash. If you’re using cash, tell the driver your final destination and the driver will advise you how much your fare is, then pay the exact fare because no change will be given; don’t forget to collect your receipt and keep it with you, as you need to show the driver every time you board the bus. me and 3 friends will start our journey to JB (sentral or larkin) at 10 pm around MBS. which one is the best for us to ride the bus? from queen , jurong east or kranji ? Hi Acah, if you start your journey to JB at 10pm from MBS, I would recommend you to take bus CW2 or SJE from Queen Street Terminal, whichever departs first from the terminal. Because if you take MRT from MBS to Kranji, you’ll spend at least 40 minutes on MRT. Meanwhile, the journey from MBS to Queen Street takes around 15 minutes by bus (PS: u can take bus 133 from MBS Theatre bus stop to Bugis Station for 5 stops, then walk to Queen Street Terminal). Regarding bus from JB to Malacca, I’m not very sure. Most of the time I take bus from Larkin in the morning/afternoon. From easybook.com I found that the last bus leaving JB to Malacca is at 8:15pm. 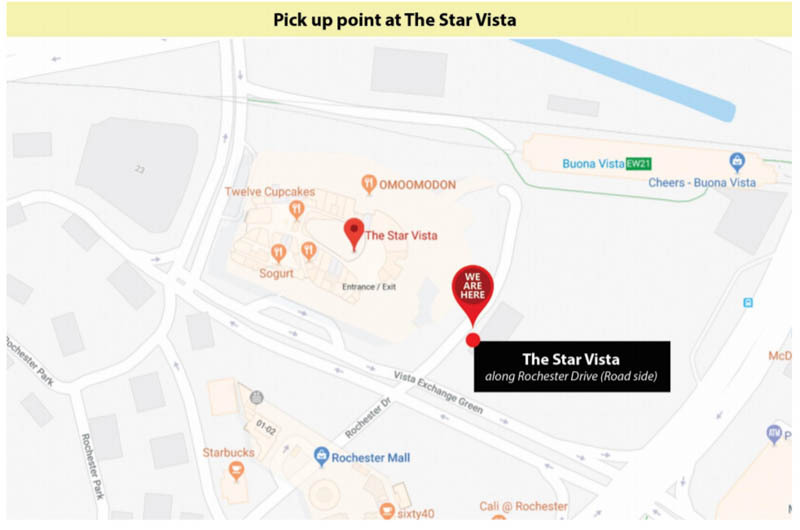 Alternatively, If you want to take direct bus from Singapore to Malacca, you can take Starmart at 9pm from Boon Lay bus terminal. I wonder is it better to use STP or Ezlink? as we have one day tour in singapore from morning until night. I think that STP will be better but it is really unlimited or 1 day for $10? and we don;t need to reload if the $10 is finished? and if STP is better , will it be better to buy the one day or two days? Hmm, will you be using STP/Ezlink during the one day tour? If your tour includes transportation, then you only need to use the card at night. The STP will expire at the end of the day (midnight) so if you only use STP at night, it’s not worth it. However, if you use STP from morning until night, it is worth it. If you buy STP 1 day ($10), once the day ends, the balance of the card will be $0. So, if you want to continue using the card the next day, you need to reload. Is it difficult to travel with luggage and trolley in the bus? We are a family with 2 childrens. I try to find the best way to go to Melacca. My fear is, bus such as 707 or KLLL buses don’t wait customers at the checkpoint. So that why I would like to take public transport. Hello, to be honest, yes it’s quite troublesome to travel with luggage and strollers on a public bus. The strollers need to be folded. 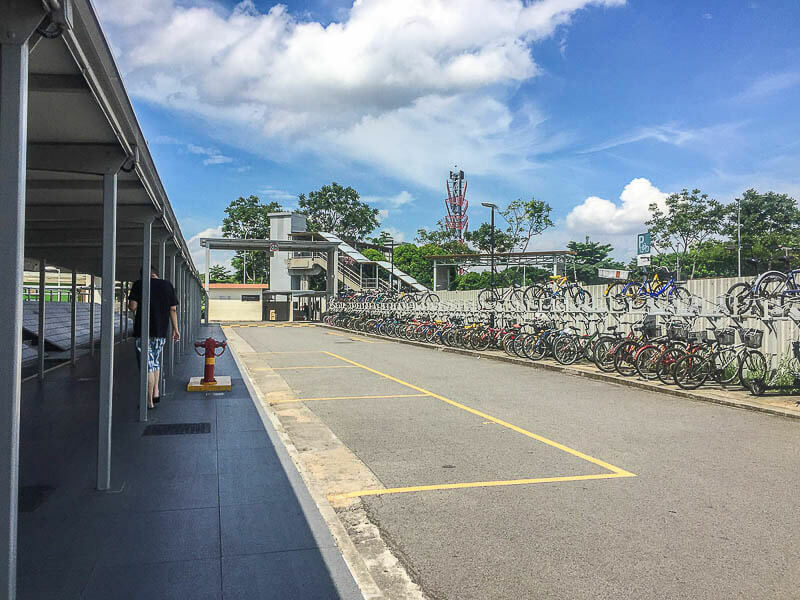 I would recommend you to take bus 707 or KKKL bus directly from Singapore, because everyone has a seat and you can store your luggage and strollers at the storage area. Furthermore, they will wait for you at checkpoints. Based on my experience, they count the number of customers on board and will not leave until everyone has come back to the bus. Thanks you very much for you advices. Hello, thank you so much for this post, it helps a lot to get rough idea how to cross the border. I will use EZ-link as my time to explore the city center is only from 7pm on the first day and I need to leave by 7pm on the second day. From my understanding, STP is not worth it for my situation, am I right? I read that in EZ-link, we need at least $3 to use the MRT and for bus – total fare from entering station to end station. I am planning to take the MRT from Bugis to Kranji, then bus 170 to Larkin. Do you think if I leave exactly $3 in my EZ-link card, will it be enough? I checked the fare from MRT Bugis –> MRT Kranji –> bus 170 to Larkin = the total cost (transit fare) is $1.96. Do I need to tap in and out every time I use the bus while passing the immigration? So far that I count, I need to drop off twice along the process there. If I need to tap in and out, do I need to pay extra or anything? Hello Hanis, I’m glad that my post is useful to you 🙂 Yes, STP is not worth it because on your first day you’ll only spend a little on transport. In my opinion, if you have $3 on your ez-link when you take MRT from Bugis, then continue with bus 170 to Kranji, it is alright. I have the experience of boarding a bus with ez-link credit less than $2 and it was fine. However, I had never tried using less than $2 ez-link card to board bus 170, but I think it should be ok. In case you didn’t know yet, the minimum top-up amount for ez-link card is $10. I’m Myanmar. When I go to Johor Bahru, is there any visa to entry? good question and answer is very helpful. Hello. Can you suggest me on what time should I cross the border from kranji to JB? I’m going to KL on 1st September and I know it’s a public holiday at Singapore. I’m taking mrt from changi at 6am to kranji, and it supposed reach kranji st. approx 60mins, which is already 7am and I have to wait for the bus. Is the JB customs gonna be heavily crowded at morning on public holiday? I’ve been queued 3 hours before at JB customs when crossing the border at the weekend. Thanks for your help. Hi Krist, it’s hard to predict what will happen. But based on previous experience, long weekends are the worst period to travel between Singapore and Malaysia by land. Last year I spent almost 10.5 hours in the bus when I travelled on Christmas Eve from Singapore to Seremban (the same journey takes just 4 hours over on normal days). If you really have to cross the border on 1st Sept 2017, the earlier you do the better. Prepare some snacks and drinks in your bag in case you got stuck in traffic jam 🙂 I have a feeling there will be traffic jam at immigration areas as well as on the road to KL. So is it better to cross the night before? Since first mrt from Changi start at 5.59 am according to changi website, I can’t use any other cheap method. I had to arrive before 2pm at KL Sentral at 1st September. Thanks for your help. Since you need to arrive at KL before 2pm, it’s better to cross the night before. If you cross in the morning, there’s a chance you’ll arrive in KL after 2pm. However do note that the buses from JB to KL may or may not operate overnight. What time will u arrive in changi? The night of 30 sept will see traffic jam too, because it’s the eve of long weekend. Your situation is quite tricky. You’ll probably need 1 hour to clear immigration and collect luggage. So you’ll take 11pm mrt to from changi airport to kranji. Last bus for 170x is at 12 midnight from kranji. U have to catch this bus, otherwise u need to take taxi to cross the border. Better options would be to fly from Singapore to KL, or take overnight bus from golden mile to KL. For public holiday, I highly recommend you to book in advance. Because if you book last minute bus ticket from counter, some ppl would try to charge you higher as they know you have no other options. Hi Eva, just to inform, I tried my first plan and totally failed. Hahaha. I take 6am MRT from Changi to Kranji, as I Arrived at Kranji, crowd start piling up, I Q for 170x and the service is especially slow. Traffic is so jam, and the human too, I got out from malaysia ciq at 9.15, but already booked 9.30 bus from larkin to TBS. so i rushed to the bus, taking 170x and end up at larkin by 9.50. My bus is already gone. People offered me ticket to KL but with doubled price. Also, Larkin has changed, last time I was there in July 2016, and now the ticket offices has gone. So I end up ordering subway sandwiches as I travel back to Singapore, which is so fast and relaxing trip as the bus is empty and checkpoint is empty. Too bad I cant refund my scoot flight from KL to SG. Hey Krist! Sigh, it’s so unfortunate that the immigration is so crowded in the morning. There are still bus counters at Larkin, but they’re hidden deep inside. you need to go inside the building and follow the arrows. Next time, come stay longer in singapore, so you have plenty of time if you need to cross the border 😀 Btw, thank you so much for telling me how your trip goes, I really appreciate it. 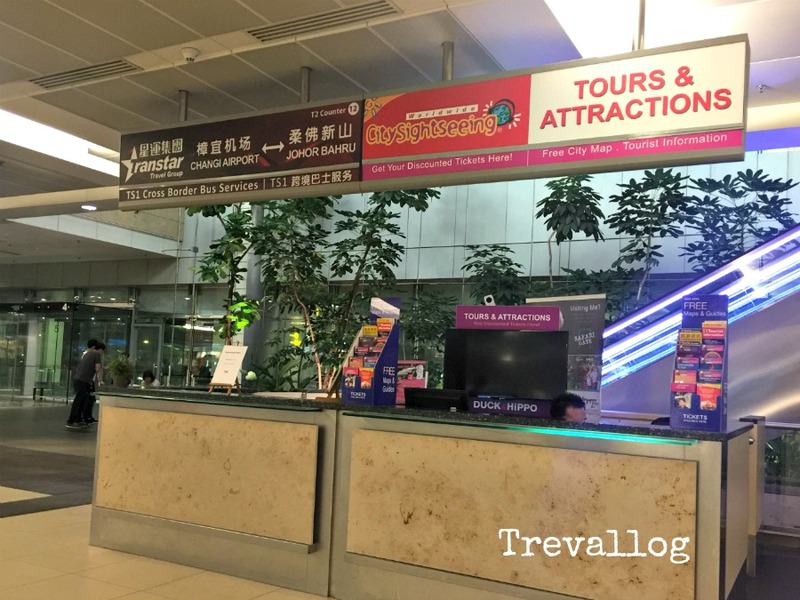 I will add information about bus counter in Larkin terminal in this blog post 🙂 Thank you! Hi, I have a few questions to ask! My destination is to go to Larkin Terminal. The most important thing for me is to reach there within the shortest time possible, with lesser stops in between too. I will be travelling with my partner, bringing along just 1 luggage. So would it be preferable if I travel to Larkin by taking either CW1 or 170X at Kranji MRT? OR if I take 950 from Woodlands Interchange? Which one would you recommend, to guarantee seats, shorter queue and also, shortest time to get to Larkin Bus Terminal? (Fyi, we have another bus to catch at Larkin that leads to KLIA2, departs at 10AM) It would be great if you can tell me what time should we board the bus to be on time. If I pay by Ezlink for the fare, does it mean that I need to pay AGAIN if I take a bus from SG/JB Checkpoint to get to Larkin? I understand that if I pay by cash, I assume that a bus ticket will be issued and I just show it to my driver? Therefore, there’s no need to pay for the fare again, right? I don’t really understand the process. It’s my first time taking public buses to JB. Hello Kathy! The buses from Kranji (either 170X or CW1) have the fastest journey compared to all other buses. However, if you’re coming from the East of Singapore, of course it makes more sense to take CW2/SJE from Queen Street instead of taking MRT all the way to Kranji. It’s hard to guarantee seats because it depends on how many people have already queued before you. If you want a seat, you can always queue until you’re at the front, then stand there and wait for the next bus. Please note that if you bring a luggage, it’s quite hard to sit down during rush hour, because the leg room in the bus is very narrow, and other passengers need to stand on the aisles. So, maybe one of you can sit down, and the other person stands and hold on to the luggage. If it’s not peak hour, you can sit on 1 seat, and put the luggage on the floor of the other seat next to you; then, your partner need to sit elsewhere. To be safe, I always allow 2 hours travelling time from Singapore to Larkin. So, I suggest that the latest time you board the bus from Kranji is 8am. The earlier the better. We can never know the queue at immigration. You can grab a bread for breakfast at Kranji MRT if you don’t have time to eat breakfast. 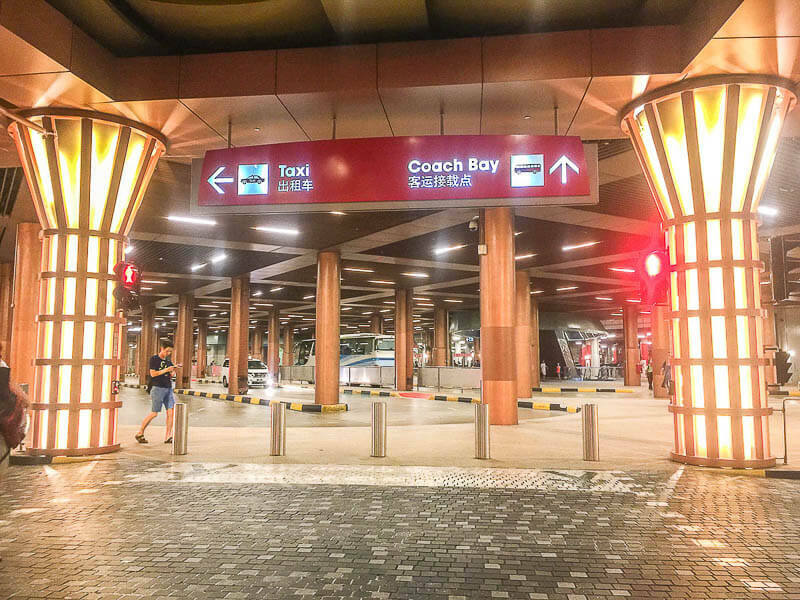 By the way, if you are really pressed for time, take taxi/Uber/Grab to Woodlands Train Station, then walk through the train station building for 7-10 mins and you’ll arrive at SG checkpoint. If you use EZ Link for 170X bus, you need to tap EVERY TIME you board and alight from the bus. Singapore bus has “transfer” policy, that means even though you keep changing bus, you’ll get discounted price because you are essentially making ONE trip, not multiple trip, to your destination. So, yes, you need to tap when you board & alight from the bus at kranji, SG immigration, JB immigration, and Larkin. For cash payment for CW, just tell the operator that you’re going to Larkin. After you pay, get the ticket from operator or machine inside the bus. The ticket will state your start point and final point. Keep the ticket, you need to show them again when you board the bus at immigration. You don’t need to pay again when you board the second time. If you take 170X and use EZ Link, please note that after clearing SG immigration, you can take either 160, 170, 170x or 950 to JB immigration. Then, after clearing JB immigration, take bus 170 to Larkin. Don’t take 160 because 160 goes to JB Sentral terminal. 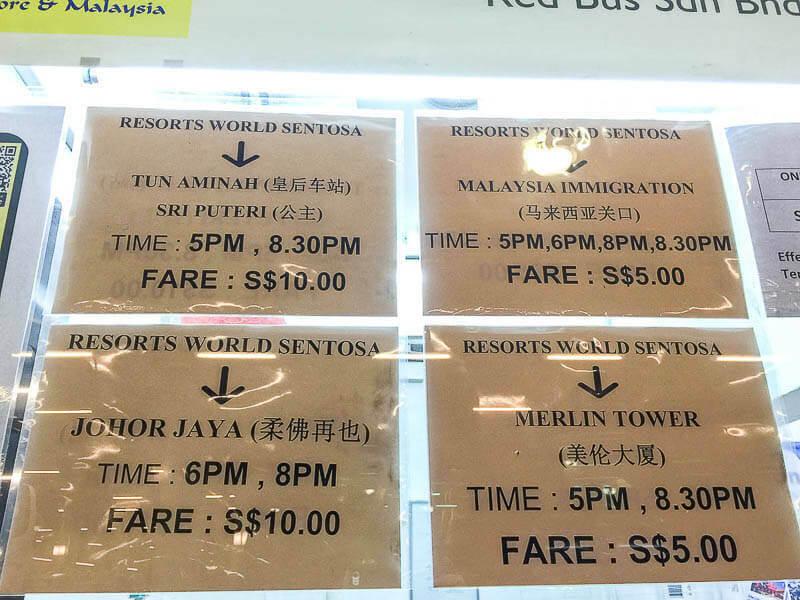 If you take CW1, after clearing SG immigration, you can take ANY CW buses to JB immigration. Then, after clearing JB immigration, you can only take CW1, CW2, to go to Larkin. Hope my answers are detailed enough 🙂 Let me know again if you have more questions! Thanks for the informative blog. I’m planning a trip next month and this comes in handy. With so many similar writing, still find yours the most straight-forward. Wondering will half-day leave at work on 22nd Dec helps my travel to MY without much jam. What do you think Ms.Eva? Thanks Vest! I think the half-day leave on Friday, 22 Dec, will certainly help you avoid the terrible jam that will happen in the evening. I guess there will still be jam in the afternoon, but not as terrible as in the evening. Hope your border crossing journey will be smooth! Thanks a lot Ms.Eva; halfday it is then! I wonder, if I book a bus from JB to KL at 1 am, what time should I depart from Queen Street Terminal. I’ll be going on Chinese New Year, so I guess I’ll need more time to arrive at JB due to the traffic. Thank you very much. I am planning on passing this border on probably one of the worst days possible, this Friday 16 Feb.
1. Take taxi/Uber/Grab to Woodlands Train Station, then walk through the train station building for 7-10 mins and you’ll arrive at SG checkpoint. 2. Catch the first CW from Kranji MRT at 4.20AM. We would go for option 2 but we are a bit worried that the checkpoint will already be busy at that time. We are happy to pay for a Grab for peace of mind to Woodlands Train Station at like 3AM in the morning. Do the checkpoints operate 24h so this would not be a problem? Is this walk reasonable with a backpack? Is it possible to do it? I am waiting for your input before we make a final decision. Thanks so much for the help! You’re right, those 2 options are possible, but I would recommend that you take the second option, which is to take the first CW from Kranji. Personally I feel that the crowd will be much lesser on 16th than on 15th; majority of the crowd would have already crossed the border to celebrate Chinese New Year by 15th Feb. So I think there won’t be a major jam at the border, at early morning of 16th. The checkpoint is open 24 hours a day. I don’t recommend option 1 becos if you cross border at 3am, there won’t be any public transport that can bring you to JB custom. So you will need to walk across the bridge. It is possible to walk with a backpack. For me, I need 30 minutes to walk across the bridge. If your backpack is heavy, maybe you can consider to take option 2 instead. If you decide to walk, be careful with the traffic! It does help a lot indeed. I did not think about walking over the bridge. Doing that at night-time could be really dangerous indeed so it sounds risky. Do you know how long it would take to get across with the first CW? Or how long it takes from Kranji to the checkpoint? I am trying to estimate if we have any chance of being at JB Sentral at 6AM if we do take the first CW, which actually is at 4.30AM (not 4.20AM). its does help me a lot. And i have one question. Does you know how long it will take Bus from Queen Street to JB Sentral during Sunday’s evening? My flight from JB (Senai Airport) to Kl around 7.15 PM. What’s time i need to leave from Sg to JB? need your suggestion? Thanks. HI, This is very helpful. =) I’ll be traveling sometime in June… Part of my itinerary is coming from Malaysia to Singapore. Im planning to leave Malaysia around 11:00pm. Is it safe? and I want to know what’s the best line to take. Can I arrive in Singapore around 6am? Many thanks!!! Hi, yes it’s absolutely safe to come into Singapore sometime around midnight. But you have to take note the last bus & train timing in Singapore. Last train from Kranji to Jurong East is 00:41, 11:09 to marina bay, 11:45 to Toa payoh, 00:34 to ang mo kio, etc. if u want to arrive in singapore at 6am, it means u leave malaysia at 5am? First bus 170 from larkin is 5:20am. We are visiting Singapore in June. We have medium luggages and we have senior companions(above 60 years old). Our flight will arrive at Friday (june 15) 5pm and go straight to Johor Bahru. What do you recommend as our means of tranportation? I am leaning towards using TS1, is this effective consodering that it is a peak time? Is TS1 bus included in the Singapore Tourist Pass? Hope you could help us. Thanks in advance. Hi Gemma, yes bus TS1 is the most effective transport method considering that you travel with medium luggages and senior companions on a Friday evening (a very peak period). No, TS1 is not included in the Singapore Tourist Pass. Hi Eva. Very helpful blog post. Just wanted to ask if Causeway is accepting EZ Link Tourist Pass? More so, Causeway Link CW2 bus trip from Queen St Terminal to Larkin Bus Terminal, can we drop off at JB CIQ instead? Hi, you mean the STP (Singapore Tourist Pass)? No, Causeway doesn’t accept STP. Yes, you can take CW2 and alight at JB CIQ. After you pass the immigration, it’s not necessary to board CW2. Need some advise from you. I’m leaving Singapore tonight 9pm from MBFC and need to be at JB Central asap, do you know what is the fastest way for me to be there ? Hi Zer Ping Tan, perhaps bus TS3 from Marina Square. how if johor to changi airport? Hi Juneci, I prefer bus 170X over CW1 because I always take MRT (not cab or other methods) to Kranji, so when I transfer to bus, I will get discounted fare. With CW1, I need to pay a full fare. For bus to KL, I’d prefer taking the bus from Larkin rather than JB Sentral because there are more choices (more timings, more bus operators, more competitive rates) at Larkin. Hi, I have a flight to catch from Senai airport at 9pm, (friday). Can you advice which checkpoint is faster. From woodland checkpoint or from tuas? 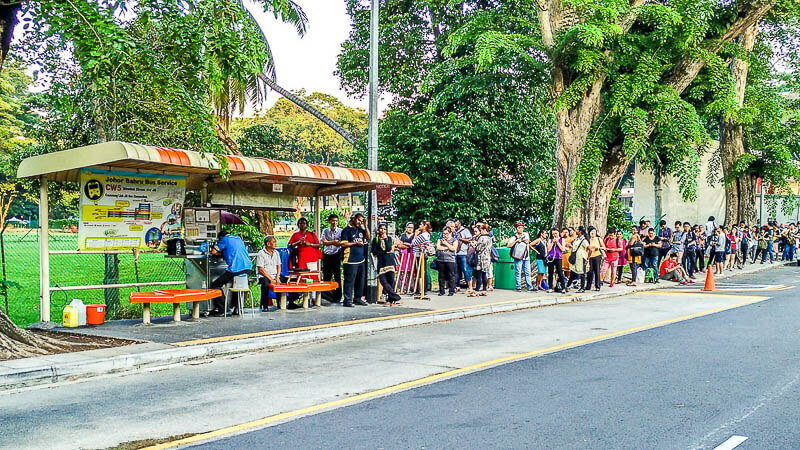 I plan to take grab to woodland checkpoint directly instead of taking the bus. Will it be faster? Leaving from clementi MRT around 530pm. Hi, leaving Singapore at 5.30pm is too late. I suggest you leave at 3pm if possible. It’s nearer to go to Senai from Woodlands. Hi Sam, it won’t be busy on Sunday morning as long as you travel before 8am 🙂 bus can be fast if you travel early. I dont know if this question has been asked before or not. But i plan to take the 170x from JB to Singapore near this time, i am planning to use my nets flaspay card to take that bus. How is the procedure on taking that bus? Let say if i tap in my card from JB CIQ to Woodlands CIQ, do i need to tap out when i exit the bus and re tap in when i get in the bus from Woddlands to Kranji or i don’t need to tap out and also not tap in when changing the bus? We will be staying in 12 Lorong 10 Geylang Road and the nearest MRT is Kallang. Which station should we go? I am thinking Newton Circus, Woodlands or Kranji MRT, The fastest route as possible as we have a flight to catch in Senai Airport at 11:15AM on February 24th to visit Kuala Lumpur. 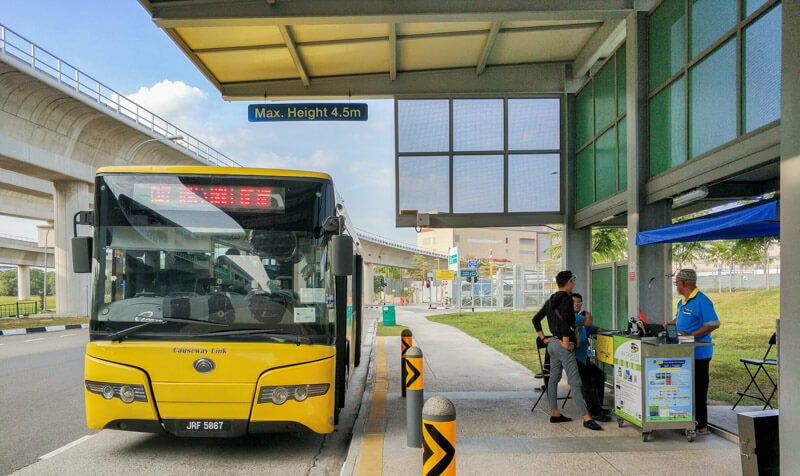 How long would it take us to reach Woodlands CIQ, and which of the bus service is best to ride? 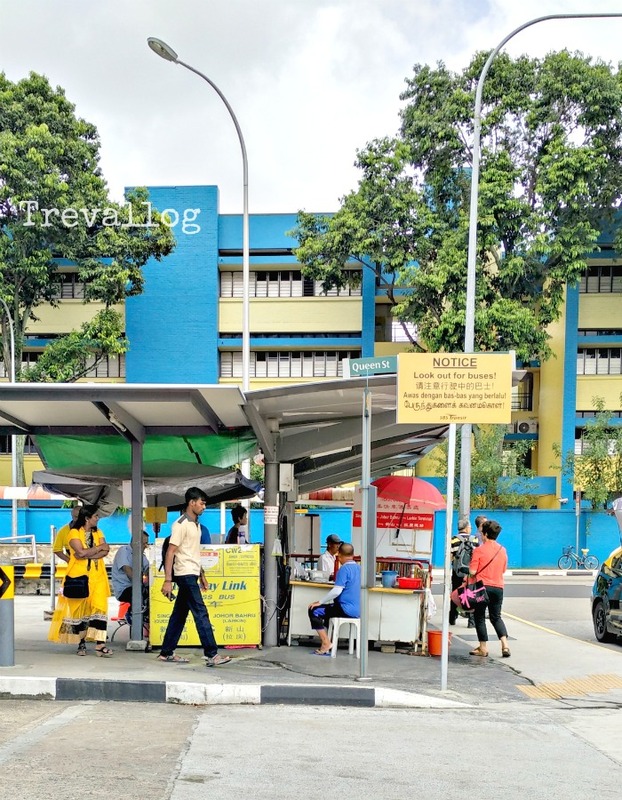 a] Newton Circus Bus Station > Woodlands CIQ ? b] Woodlands Bus Station > Woodlands CIQ? c] Kranji Bus Station > Woodlands CIQ? Or do you think it would be best just to ride a taxi from Lorong 10 Geyland to Woodland CIQ and would reach the destination in 30min to 1hour? First of all, how will you go to Senai airport from JB Sentral? I presume you’re taking Causeway Link shuttle bus from JB Sentral. If so, you MUST catch the 8am bus in order to arrive at Senai Airport at 8.50am. What a wonderful resource you have here – thanks so much. I hope you can give me some tips for a trip I’m planning in July. To save $$$ I’m arriving in Changi Terminal 2 and need to find a way to get to JB Senai Airport to grab a flight to KL (AirAsia). What do you think is the best way? So far, I was planning to use the Transtar to JB CIQ and then use the AA1 Senai Airport Shuttle to get there. Is this the best way? If I touch down in Changi @ 7pm on a Friday, how long do you think it would take to get to Senai? Should I just do a Grabtaxi when in JB? Or should I just give up on connecting @ Senai on the same night and just spend the night? To be honest, travelling from Singapore to JB on a Friday evening is a nightmare. Your plane will touch down at 7pm at Changi, so you’ll be able to come out from airport at around 7.30 to 8pm. If you take Transtar bus, the next bus is leaving from Changi at 9.15pm. 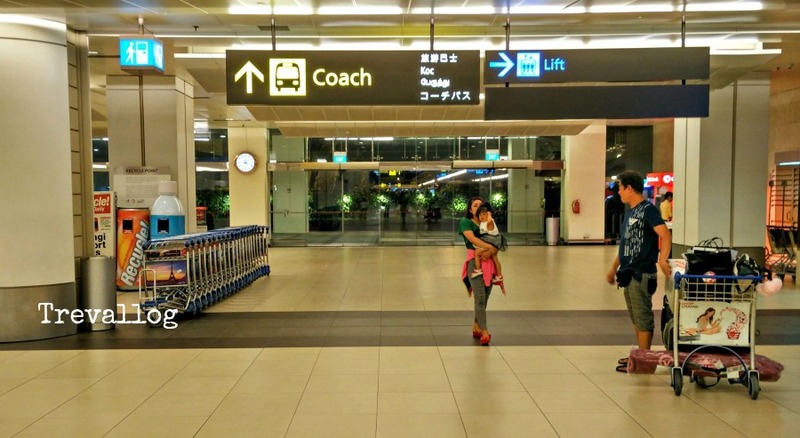 From Changi to Woodlands, it takes 1 hour, so you’ll arrive at Woodlands at 10.15pm. To clear both SG & MY immigration on Friday evening, be prepared to spend at least 2 hour in total. In other words, I estimate you’ll clear the immigration around midnight. I’m not sure what time your flight at Senai is, I assume it to be around 11.15pm. So, I think it’s not possible to catch this flight from Senai. One of my friends who used Transtar from Changi to JB Sentral said that it takes an hour to get there. Note that when you arrive in Woodlands CIQ, there is quite a long queue to pass the immigration, 15 to 30min should I say. 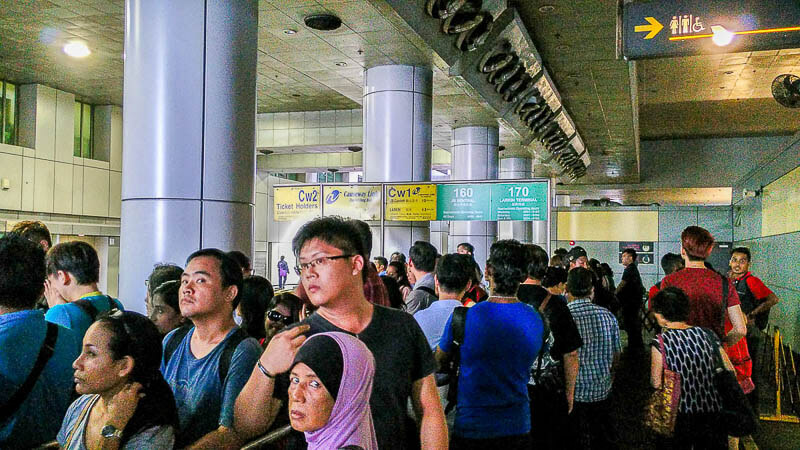 If you are lucky enough to get a train ticket from Woodlands CIQ to JB Sentral CIQ, that will only take 5 minutes. Otherwise, you’ll have to catch the same bus (I guess) and reach JB Sentral CIQ in 5 to 10min. There will be another queue to pass the JB Immigration and that’s another 15 to 30minutes. Then you’ll have to ride a bus again AA1 going to the Senai Airport and that would take 50minutes. On our end, what we did is from our nearest MRT, we hop off the train to Newton Circus MRT. Then had to walk to the car park where the Cause Way Link bus is. CW5 to be specific. You’ll pay for the ticket when you hop on the bus and the travel time is around 45 to 1hr to reach Woodlands CIQ, with no traffic. It gets busy once you read WL CIQ so you need to hop off and walk towards the immigration. Considering that there are a lot passing the immigration, it might take 15 to 30 minutes. Once done, you have to either ride the train if you have booked the ticket ahead of time or ride again the CauseWay Link bus CW1 or CW2 and just show your ticket to the driver. That’s another 5 to 10min ride before reaching JB Sentral. Pass the immigration again and allot 15 to 30min to do that. Ride the AA1 bus which would take 50min to reach Senai Airport. By the way, it takes 1 hour from KLIA 2 to KL Sentral via Grab Taxi. So if you arent staying in KL Sentral, then it would be a longer journey. I also suggest that you stay one night in SG and just go to Malaysia the next morning. Check the bus and MRT schedules whichever worked for you. Taxis would work too but it would be very costly. Thanks Eva and Xina for your generous help. Unfortunately, taking an 7hr bus ride after 20+ hours on planes is getting a hard pass from wifey and kids. Looking like I will take your advice, Xina, and stay a night in SG and then find a way to get to JB for the next day. Would you happen to know what the Grab taxi rates are in SG? I’m thinking of staying at one of the inns near Geylang so prob just taking a ride rather than MRT + walk. Yup! We had our infant too when we travelled to Malaysia. Our flight from Senai to KL is at 11.55AM. We left the hotel at Kallang at 6AM. We have plan to go to Legoland Malaysia on Thursday, October 31, 2019. We will leaving from Aljunied MRT Geylang that morning, and countinue straight to Legoland. I have read that Tuas CIQ is closer to Legoland than Woodlands. We have 2 children (8 and 6 years old) and my 64 yo dad travel with us. Can you please give us suggestion, which bus will be the best for us? I’m thinking of taking CW3 bus from Jurong East and continue it with JPO2 from Malaysian CIQ directly to Legoland. Or you have better option for us to take? We hope we can arrive at the Legoland around 10/11 am. After finish play at the Legoland, at 5.30 pm we will take Grab to Senai Airport to catch our 8.15 pm flight to KL. Hi Desak Armi, yes, Jurong East is the best place for you to catch a bus to go to Legoland from Aljunied MRT/Geylang. You can take either CW3 or CW4, whichever comes first. Then, you alight at Tuas Checkpoint and get your passport stamped. Then take ANY CW buses to JB Second Link CIQ. After your passport is stamped with Malaysia’s stamp, then you can take CW7/CWL7or JPO2 to Legoland. Please note that JPO2 bus is very infrequent, they’re only operating at 8.30am, 11.30am, 2.30pm, 5.30pm from JB 2nd Link CIQ. Hi, can you advice where can I buy the KTM train ticket? Any time schedule for the train? I plan to take the train from Woodland to JB Sentral. Best way to do this is to go to easybook.com. Choose the train section, enter your dates, and it will tell you what is available and when/how much. You can book from there as well. Unfortunately, it doesn’t allow you to book too far ahead (looks like ~ 1 month) of time. You need to book the ticket ahead of time.. 2 weeks or more should I say? Riding the bus is convenient, too. It also only takes 5 to 10minutes to reach JB CIQ. Ticket always sold out if go through online. I wonder if I can buy and is available at the ticket counter? do i need to present a return ticket? This is my first time to cross border to JB and I would also like to ask if the immigration from the border is strict with this? Hi Bong, yeah if you’re unlucky, they’ll ask you about details of your visit. If you’re staying for a week, it’s better to have a proof of accommodation and onward travel plan. At the end of your 1 week stay in JB, if you’re going to Singapore or KL, I recommend that you have proof of hotel stay in Singapore or KL. It doesn’t have to be a ticket, because they know you can just take public bus from JB to Singapore or KL. Hai eva…many thanks for your write here, this is the most clearly information i’ve got about how to go to JB with a public transportation.. However, i hope you can answer my following question soon, because i need to go to jB right now…how to differentiate (physically) between SBS 170x and 170…acccording to your picture they are all have same figure..
Hi Hadi, for 170X, the number “170X” will be displayed in the LED scrolling text in front of the bus, or it will be displayed on a blue plate. Thanks for this excellent info, it’s very nice. Still need to ask something 🙂 Can you use Singapore touristpass with 170X bus from Kranji and from JB?